What is it? Does it affect me? What can I do? It seems to me that MiFid II and the information around it are unnecessarily complicated. While updating myself on the legislation and impact, I’ve read many articles and thought pieces, taken part in webinars and looked at surveys on the subject and it feels like they’re trying to make it unfathomable? “The top 4 things to do ahead of MiFid II”, “have you addressed these 5 areas of MiFid?”; “8 things firms should be aware of in relation to MiFid II”… and none of the items on any of those lists appear on other lists! It just seems endless and there is very little consistency around the information out there. The problem appears to me to be because the MiFid II rules are so wide reaching, with rules for providers, rules for ‘exempt’ advisers (not so exempt then), rules for investment managers, for advisers who manage client money, and rules that apply to all of the above. The entire point of MiFid II is investor protection. Yes some rules are onerous, but they all have this one theme in common. If you wanted to vary your permissions with the FCA in light of the new MiFid II categorisations you needed to have done so by 3rd July 2017. The impact on you and your firm will vary greatly, depending on whether you are considered ‘article 3 exempt’. What the chuff is article 3 exempt? Do you hold client money or assets? Do you execute deals for your clients or provide discretionary management services? Do you deal with any ‘non mainstream’ products, or any that are unregulated or unauthorised? If you answered no to all of these, you are likely to be considered an “exempt investment” firm, under article 3. This does not mean that MiFid II does not impact on you. But it does mean the impact may be less. However, the FCA must apply rules that are “at least analogous” to the relevant MiFid II rules, meaning that, as an FCA authorised firm, much of it will be applied to you anyway. One thing to bear in mind, as noted above, the aim of MiFid II is investor protection, so following the rules, even if you are “exempt” will only be a good thing for your clients, and can only be considered good practice. There are many parts of MiFid II that you need to be aware of, but that you can do nothing about. Helpful huh?! In particular, this is being aware of the MiFid II rules that affect the providers. You can’t change what they do, but you can understand what they should be doing, and speaking to them to ensure they are ready for the incoming rules. A good webinar on this is the one 7IM did recently which you can watch here. 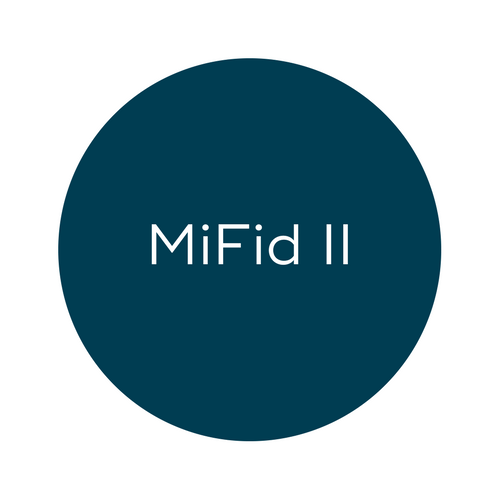 This looks at MiFid II from the provider point of view, the extra steps they will be taking, and also touches on the adviser requirements. Transaction reporting – For the most part, the providers you work with will deal with this. However, in order for them to do this, they need identifying data on each of your clients. For personal clients, this is just their National Insurance number, which they probably already have. For others, e.g. ex pats, trusts, corporates and charities, they need an LEI. You as a firm may also need an LEI; they can take 3 months to obtain and cost £115 + VAT to set up and £80 + VAT annual maintenance. This is pending clarification from the FCA, and will likely only be the case if you use a DFM. If so, check their position with them and, if necessary, get your application for an LEI in. Client reporting – reports back to the client are now to be issued quarterly, instead of 6 monthly from providers. This is to increase transparency and ensure clients are updated with their portfolio. A more controversial aspect to client reporting is the need for “managed portfolios” (understood to be DFMs, not adviser managed portfolios) to contact a client if there is a loss of 10% or more, in between the quarter reports. Wonderfully another document, EMT (European MiFid Template) is to be provided from 2019, in additional to KIIDs, factsheets etc. This will have a mandated format to follow to document costs and charges, in yet another attempt to make them clear for clients. It will be interesting to see how this one pans out. I suspect having 3 or 4 or 5 different documents to clearly show charges is, um, not that clear. Risk profiling – MiFid II states that advisers need to ensure the risk profiling tool they use is ‘fit for purpose’ and that limitations must be identified and actively mitigated. This is something you can, and should, be doing now. Rory Percival recently released a report that can assist with this. Inducements – I’d like to say that everyone knows the rules on this by now and that there shouldn’t be anything new with it. However, a recent kerfuffle over a certain platform offering certain benefits if a certain amount of business was placed with them would suggest otherwise. The MiFid rules aim to ensure conflicts of interest are managed properly. Any ‘hospitality’, or event MUST show a clear benefit to the client. This is usually through some sort of education piece. Use your judgement on these and whether your provider, and therefore you, are at risk of breaching the rules. Telephone recording – you probably already saw that there was a backtrack on the original rules. You do not have to record every call. But you do need to keep thorough written notes of calls and meetings and anything that may result in business being transacted. Complaints – your existing complaints procedure now needs to be supersized. Existing rules will apply but be extended to professional clients (not just retail) as well as potential clients. There is a clear requirement under MiFid II to establish a complaints management policy. Your compliance provider should be able to help with this. So there we go. That’s a summary of some of the main points. As with most things in legislation (and finance), the intention is noble, the delivery could maybe be improved. It should be pretty manageable for adviser firms and, um, good luck to the fund managers and DFMs! Legal Entity Identification code. If they don’t already have them, they can be obtained from Unavista. There is a cost to obtaining LEIs, both upfront and maintaining annually. Providers will ask for LEI’s on new applications for any client that comes under this classification, and will not set a plan up without them.